Contains natural sources of Vitamin C, rosehips and acerola. The human body does not manufacture its own Vitamin C and so it must be sourced from our diet. Stress of all kinds, including ill health and emotional stress, increases the excretion of vitamin C from the body and may increase the need for this vitamin. If dietary intake is low or an individual`s need is particularly high, vitamin supplementation may be of benefit. Adults - Take 1 tablet a day with a meal, or as professionally prescribed. At the onset of cold symptoms the dose may be increased to 3 tablets a day. 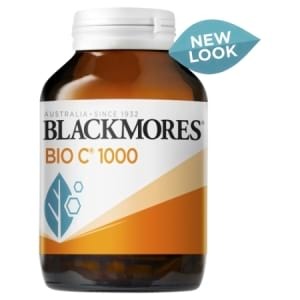 Children 4-12 years - recommended is Blackmores Bio C Chewable. Consult your healthcare professional before use if you have had renal calculi (kidney stones). Ascorbic acid may increase the risk of recurrence of calcium oxalate calculi. Always read the label. Use only as directed. Blackmores Bio C 1000mg may interfere with certain other medications you may be taking.